Well, things still look pretty good around here, but they haven’t changed quite as much as I’d hoped over the last few weeks. To keep things from getting boring for those of you who check in regularly, I’ve made an extra effort to pick out some new plants and pairings for this Bloom Day, and to try some new angles and lighting conditions on some familiar areas. 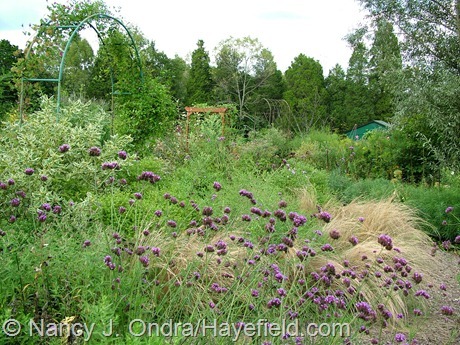 Above, golden lace (Patrinia scabiosifolia) with narrow-leaved ironweed (Vernonia lettermannii). 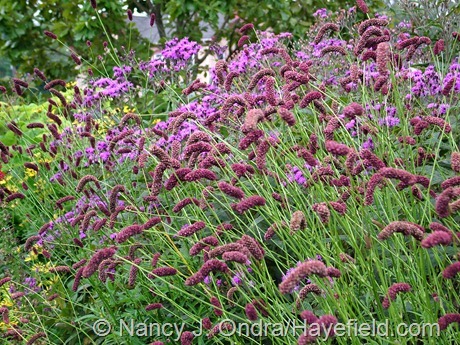 Below, Japanese burnet (Sanguisorba tenuifolia) against giant ironweed (Vernonia gigantea). 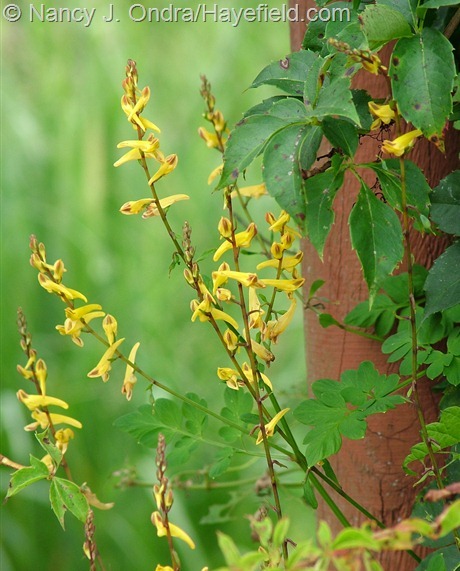 Above, Corydalis ochotensis. I started this one from seed many years ago and have been trying to get rid of it ever since. Somehow, a few seedlings always elude me, which I’m happy about at this time of year. The plant above is blooming at about 4 feet tall. 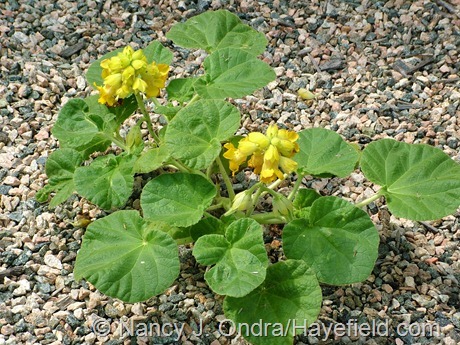 Below, another self-sower: devil’s claw (Proboscidea lutea). It came up late in an unexpected place and is just now starting to form its intriguing curved pods. 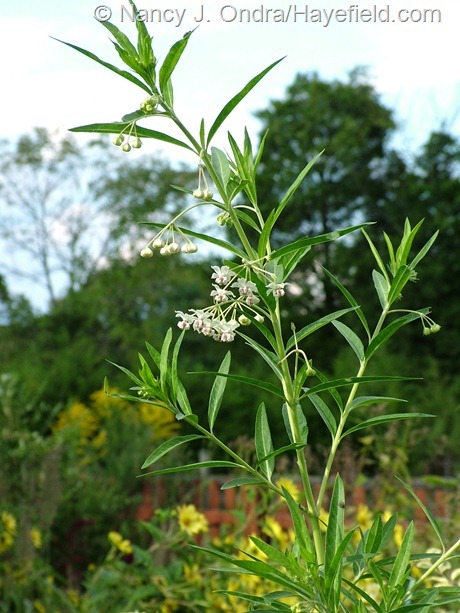 Swan plant (Gomphocarpus physocarpus), above, is another annual with showy pods, but it flowers so late for me that I rarely get to see them. Still, the flowers are nice. 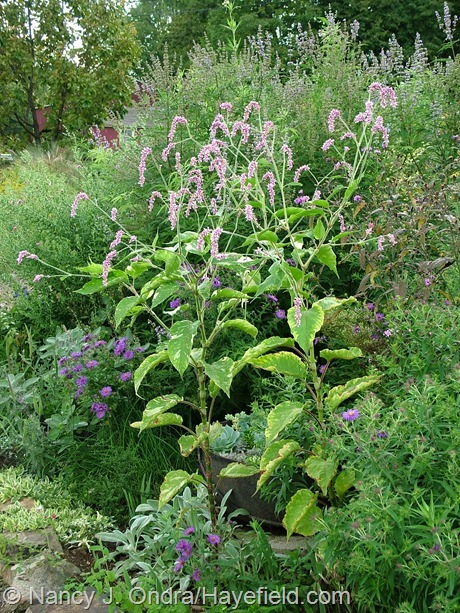 Variegated kiss-me-over-the-garden-gate (Persicaria orientalis ‘Shiro-gane nishiki’), below, self-sows dependably and is always good for color at this time of year. 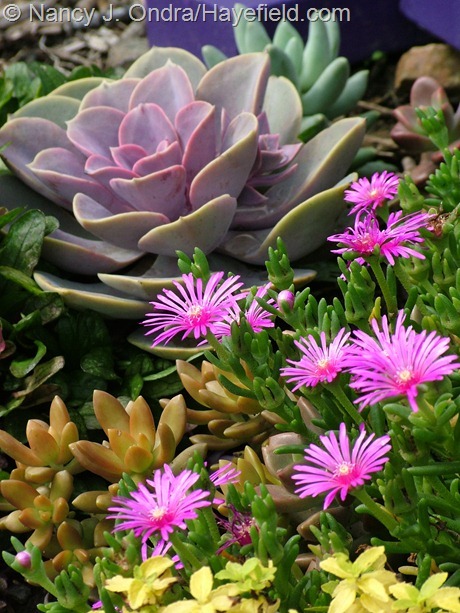 Above, ice plant (Delosperma cooperi) with orangey Sedum nussbaumerianum and pink Echeveria ‘Perle von Nurnberg’. 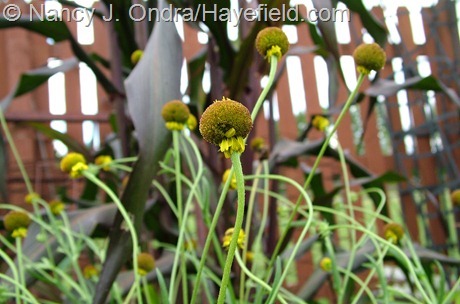 After seeing it in seed catalogs for several years, I finally decided to give ‘Autumn Lollipop’ sneezeweed (Helenium puberulum) a try this spring. It’s been flowering for about a month now in a nursery bed out back. I can’t decide whether I like it or not. It’s not as pretty as it is in the catalogs, but it has a sort of charming silliness. 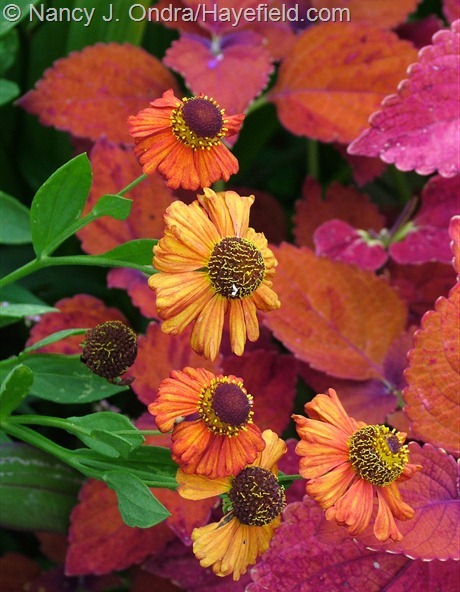 ‘Coppelia’ is an altogether more civilized selection of Helenium: above with ‘Sedona’ coleus and below with ‘Black Pearl’ pepper. Above, an annual that I haven’t grown for ages: ‘Staircase’ lion’s ear (Leonotis nepetifolia var. 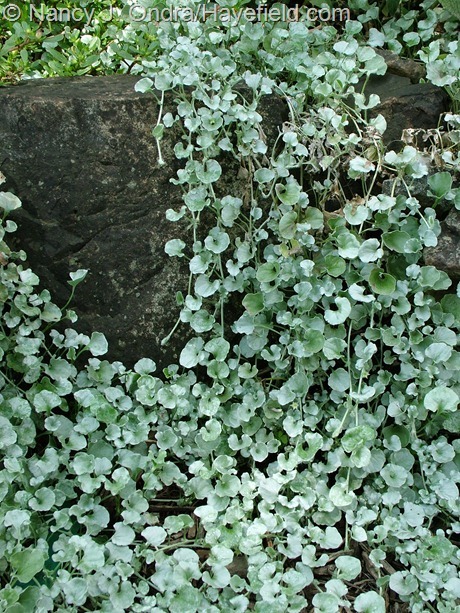 nepetifolia). Started from seed in late March, it’s now over 6 feet tall and just starting to flower. 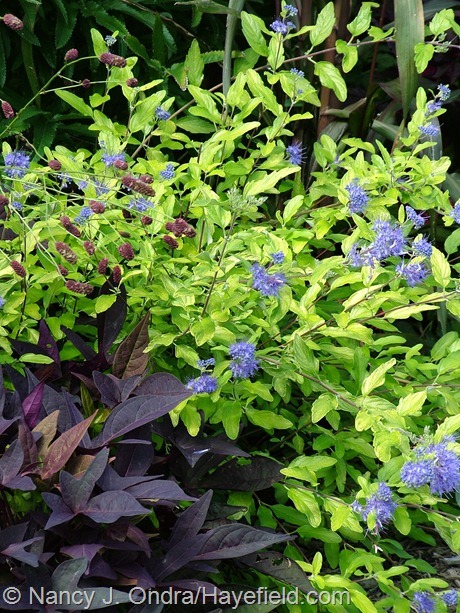 Below, a grouping of ‘Sweet Georgia Deep Purple’ sweet potato vine (Ipomoea batatas) with a toppled bit of Japanese burnet (Sanguisorba tenuifolia) and a self-sown Caryopteris seedling. 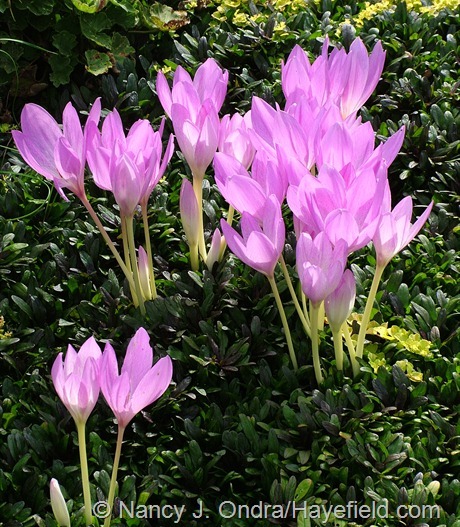 This is prime time for autumn crocus (Colchicum). 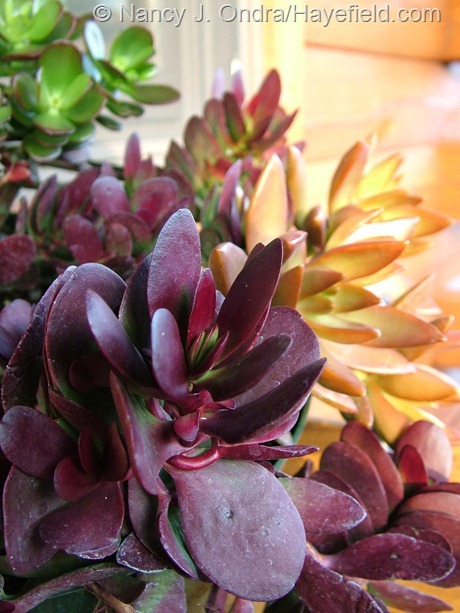 Above is ordinary C. autumnale with ‘Sedona’ coleus and ‘Angelina’ sedum (Sedum rupestre). Below is ‘Rosy Dawn’ coming out of creeping bramble (Rubus rolfei). 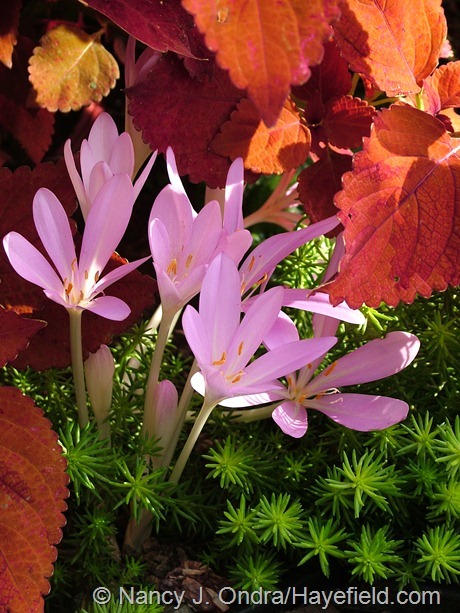 And below, Colchicum ‘Violet Queen’ with Chocolate Chip ajuga (Ajuga reptans ‘Valfredda’). Coneflowers are a classic part of the fall garden, too. 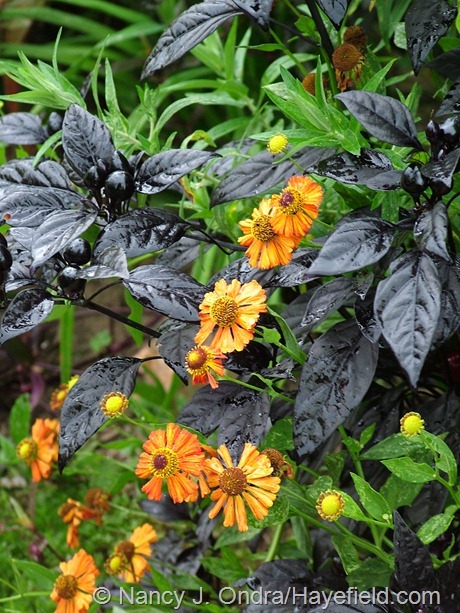 Above is orange coneflower (Rudbeckia fulgida var. 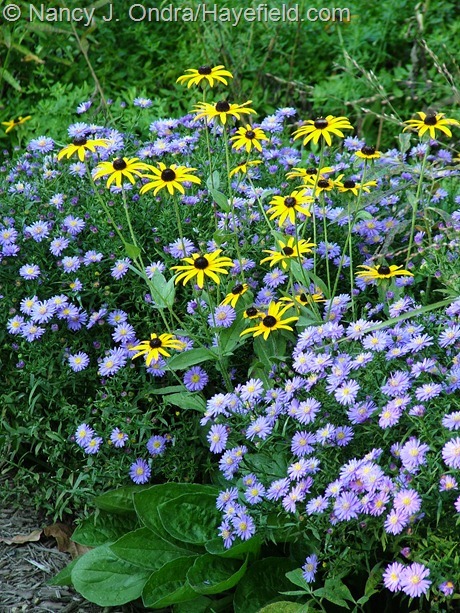 fulgida) with ‘Sapphire’ aster (Symphyotrichum dumosum). 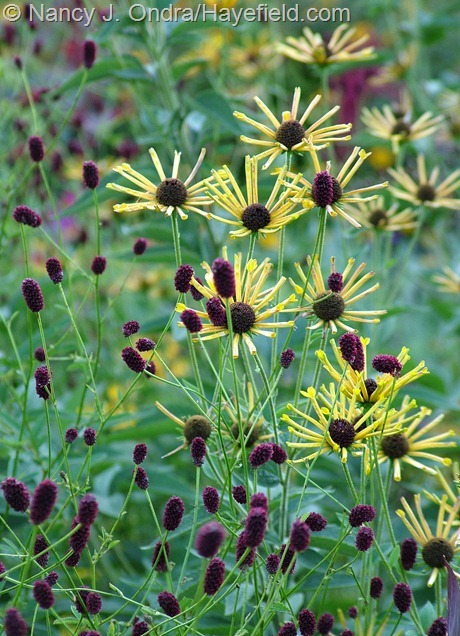 Below is ‘Henry Eilers’ sweet coneflower (R. subtomentosa) with great burnet (Sanguisorba officinalis). I decided to keep the grasses to a minimum this time, so I’ll show just three. Above, the annual Job’s tears (Coix lacryma-jobi). 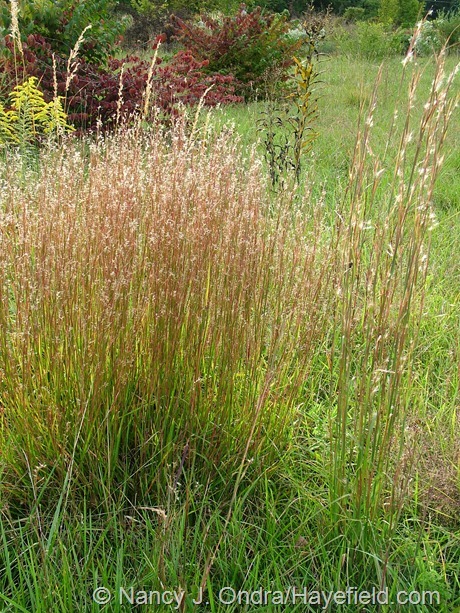 Below, prairie dropseed (Sporobolus heterolepis). And below, ordinary fountain grass (Pennisetum alopecuroides). Next, in honor of tomorrow’s Foliage Follow-Up event, sponsored by Pam at Digging, a couple of leafy shots. Above, ‘Mezoo Trailing Red’ Livingstone daisy (Dorotheanus bellidiformis) mingling with ‘Silver Falls’ silver ponyfoot (Dichondra argentea); below, ‘Silver Falls’ by itself. 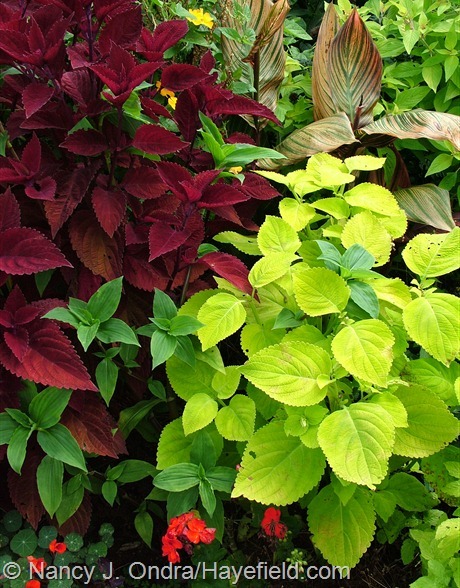 Above, ‘Big Red Judy’ and ‘Giant Exhibition Lime’ coleus with green widow’s tears (Tinantia erecta) and striped Tropicanna canna (Canna ‘Phaison’). 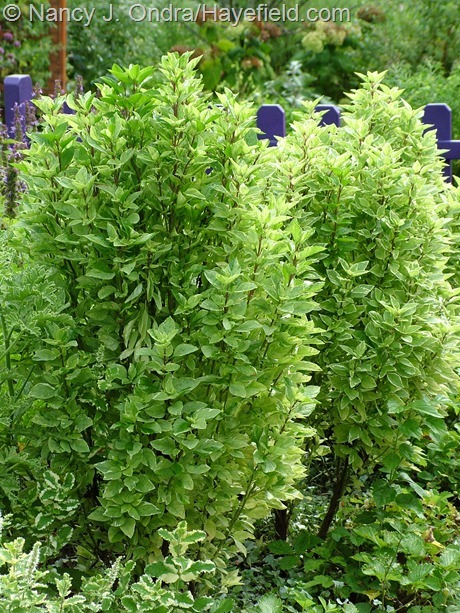 Below, ‘Pesto Perpetuo’ basil (Ocimum). 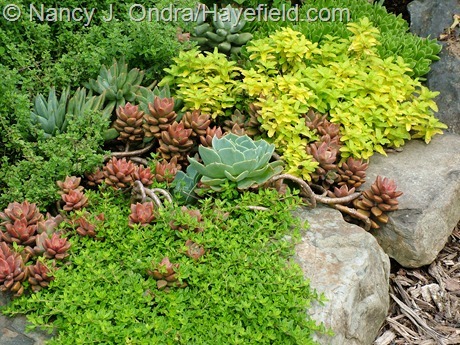 Above, blue echeveria (Echeveria glauca) with ‘Yellow Transparent’ thyme (Thymus), xGraptosedum ‘Bronze’, variegated lemon thyme (Thymus x citriodorus ‘Aureus’), and ‘Aztec Gold’ creeping speedwell (Veronica prostrata). 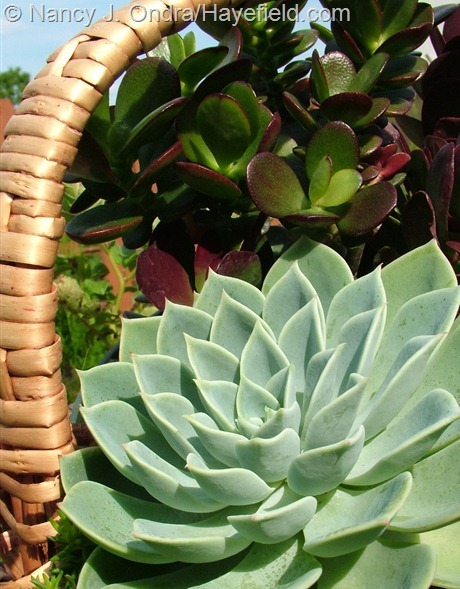 Below, Echeveria ‘Blue Atoll’ with ‘Baby Jade’ jade plant (Crassula ovata). 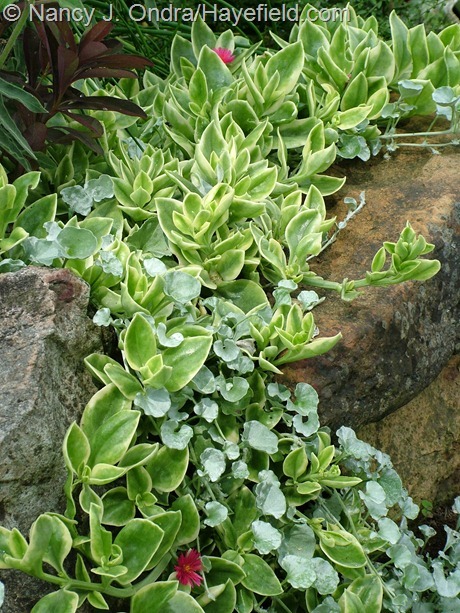 And below, ‘Large Red Carpet’ jade plant (Crassula radicans). 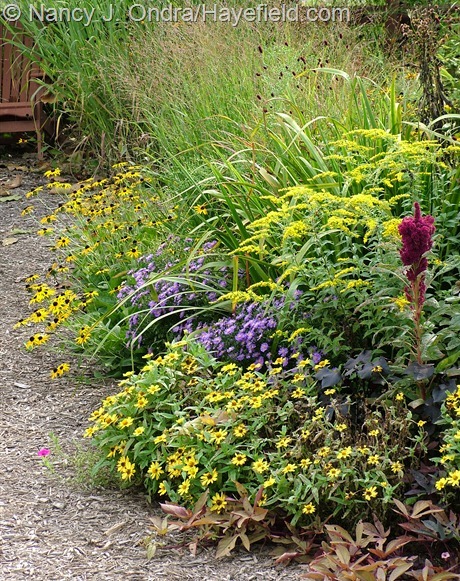 Above, the Arc Borders, with ‘Cassian’ fountain grass (Pennisetum alopecuroides), ‘Fireworks’ goldenrod (Solidago rugosa), ‘Skyracer’ purple moor grass (Molinia caerulea), and Arkansas bluestar (Amsonia hubrichtii). 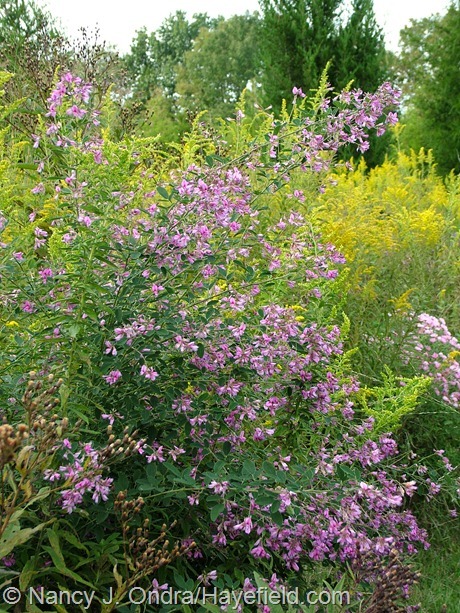 Below, bush clover (Lespedeza thunbergii) in the back arc, on the edge of the meadow. 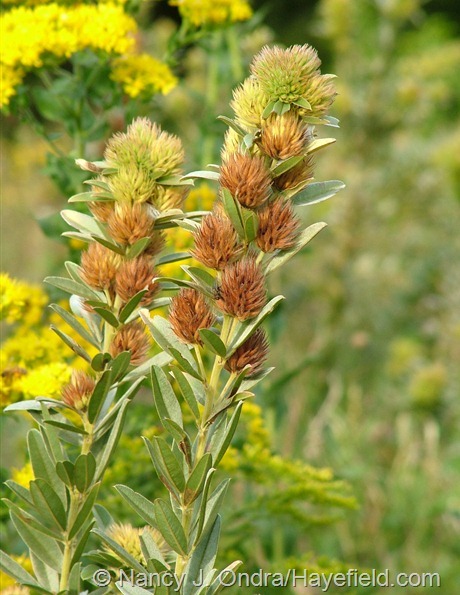 Above, stiff goldenrod (formerly Solidago rigida, now Oligoneuron rigidum) in the lower meadow, along with round-headed bush clover (Lespedeza capitata, below). And below, a nice clump of little bluestem (Schizachyrium scoparium, left) next to a bit of broomsedge (Andropogon virginicus). And last, a bunch of garden shots. Above, the courtyard; below, the front gate. Above, the front path. 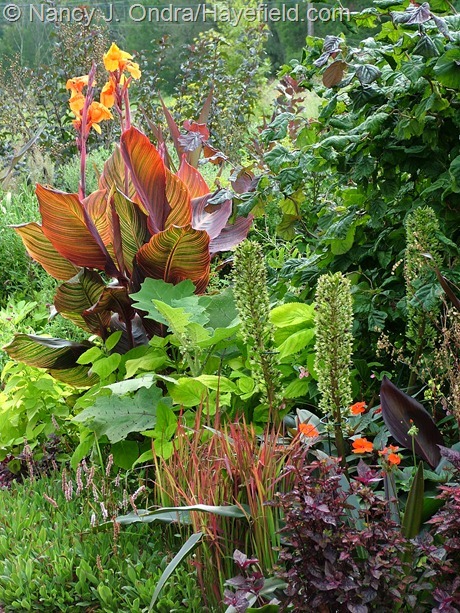 Below, a bit of detail from the right side of the path, with Tropicanna canna (Canna ‘Phaison’), ‘Red Majestic’ contorted hazel (Corylus avellana), ‘Oakhurst’ pineapple lily (Eucomis comosa), New Guinea impatiens, ‘Red Splash Select’ polka-dot plant (Hypoestes phyllostachya), Japanese blood grass (Imperata cylindrica ‘Rubra’), dwarf fleeceflower (Persicaria affinis), bed-of-nails (Solanum quitoense), and ‘Exhibition Giant Lime’ coleus. Above, the front path from the opposite direction. 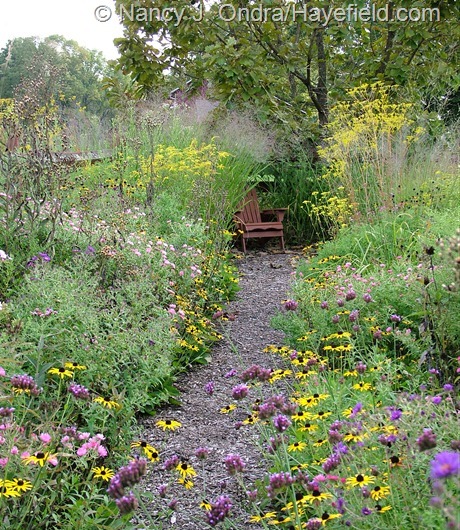 Below, the middle path in the front garden. 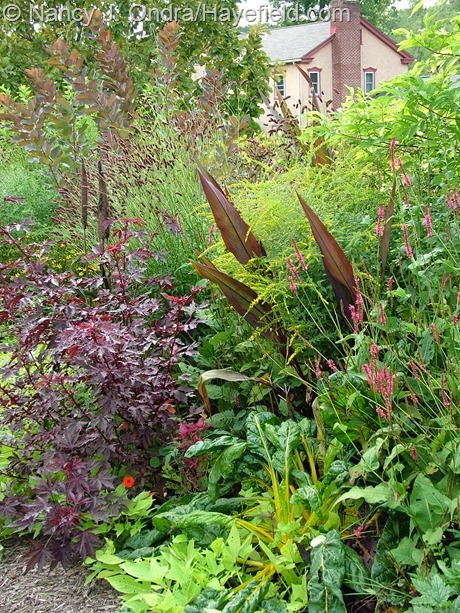 Above, detail from the middle path: ‘Intrigue’ canna, ‘Fireworks’ goldenrod (Solidago rugosa), ‘Taurus’ mountain fleeceflower (Persicaria amplexicaulis), ‘Bright Lights’ Swiss chard, ‘Sweet Caroline Light Green’ sweet potato vine (Ipomoea batatas), ‘Mahogany Splendor’ hibiscus (Hibiscus acetosella), Japanese burnet (Sanguisorba tenuifolia), and ‘Grace’ smokebush (Cotinus). 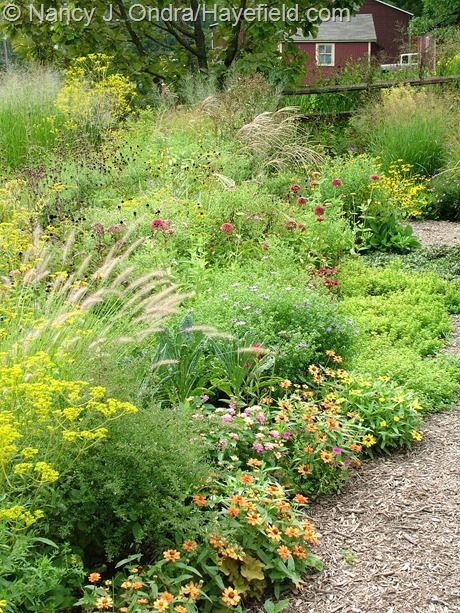 Below, ‘Elephant Head’ amaranth (Amaranthus), ‘Profusion Yellow’ zinnia, ‘Sweet Caroline Bronze’ sweet potato vine (Ipomoea batatas), ‘Sapphire’ aster (Symphyotrichum dumosum), orange coneflower (Rudbeckia fulgida var. fulgida), ‘Rotstrahlbusch’ switch grass (Panicum virgatum), and ‘Gerald Darby’ iris (Iris x robusta). 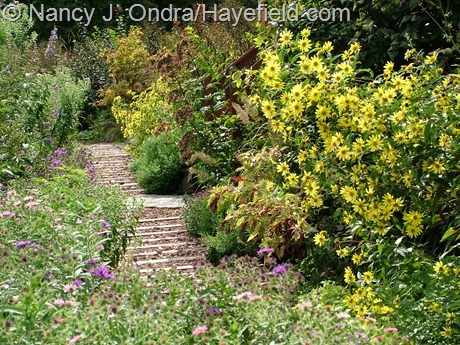 Above, Joe-Pye weed (Eutrochium maculatum), golden European cranberry bush (Viburnum opulus ‘Aureum’), Arkansas bluestar (Amsonia hubrichtii), orange coneflower (Rudbeckia fulgida var. fulgida). 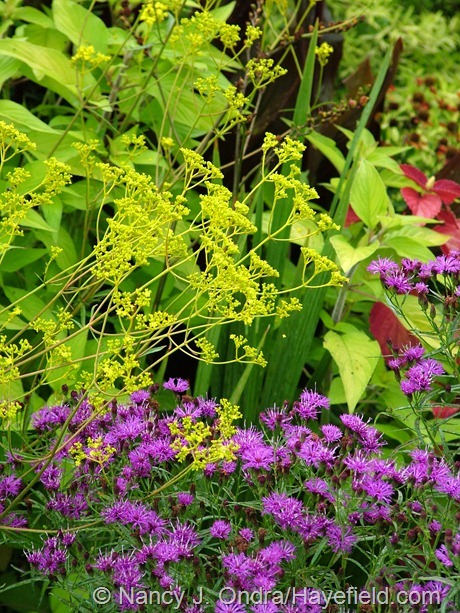 ‘Lemon Punch’ coreopsis, pink knotweed (Persicaria capitata), and ‘Caramel’ heuchera. 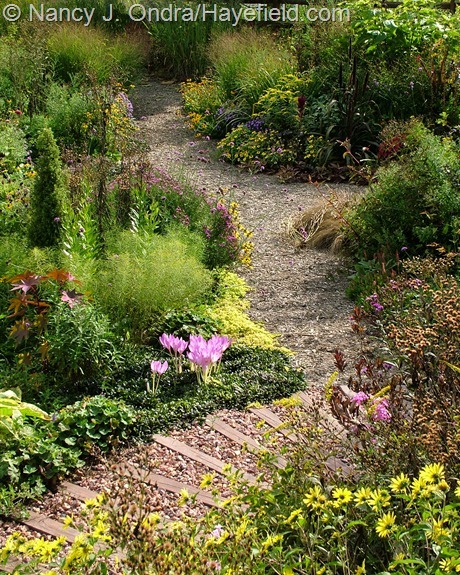 Above, the path separating the front and side gardens. 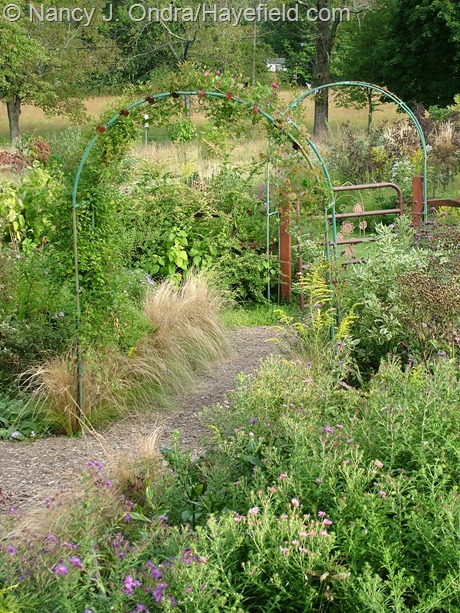 Above and below, paths in the side garden. And following, a bunch of miscellaneous shots from the side garden. Aaah, what a glorious autumn it has been. I have a feeling we’re getting set up for an early frost this year, but in the meantime, I’m just going to enjoy how things look now. 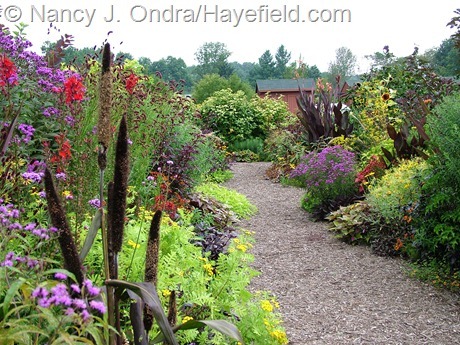 To see more fantastic fall gardens, check out the list of participants in this month’s Garden Bloggers’ Bloom Day post at May Dreams Gardens. Thanks for visiting! So many fantastic combinations. I’m hard pressed to pick favourites, but the ‘Henry Eilers’ / ‘Japanese Burnet’ pairing certainly caught my eye. 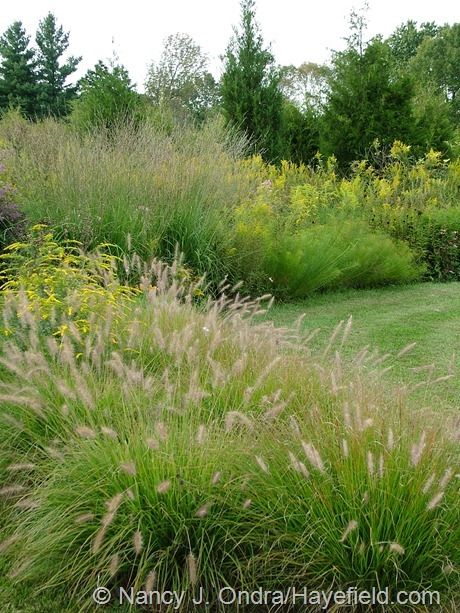 I also loved the grasses. Your garden is just magnificent. Thanks for visiting, Bernieh, and for your comment. We’ve been very lucky weather-wise over the last 6 weeks, which has made all of the plants very happy this fall, and I think they look better than they ever have. 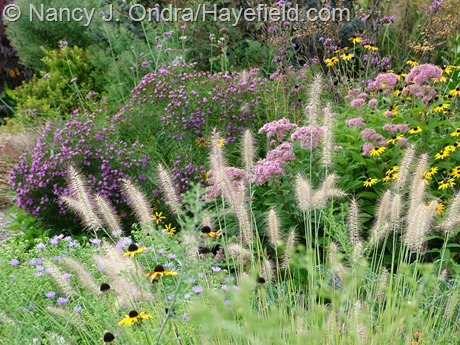 That combo of ‘Henry Eilers’ and the sanguisorba is one of my favorites, too; wish I could take credit for planning it. You are winning this game. You make picking a favorite photograph or favorite combination very challenging. The last two images are simply stunning and elegant. Perhaps you may consider: ‘Nan’s Custom Note Cards,’ maybe a box of 12, with envelopes, using your favorite images? On second thought, forget the envelopes, your followers would buy them and never mail them. Thank you for sharing and lighting up our monitors and lives! Wait – how about a “Build a Border” card game: a deck of cards with a favorite plant on each one, and you can match them up to make great combinations? The possibilities are endless. Thanks for checking in, John! 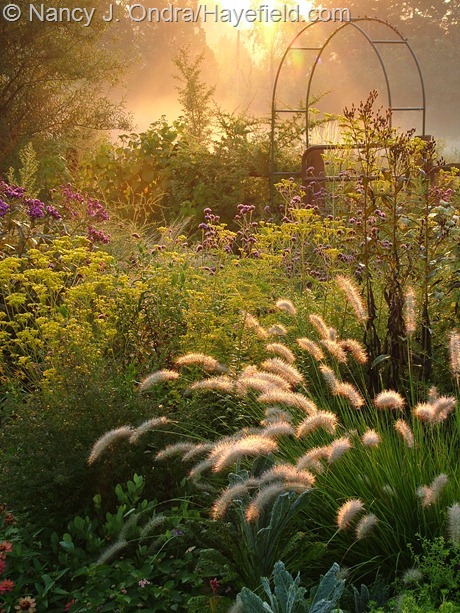 Nan…as always, your garden delivers on every level…but that second-to-last photo…with the low sun and mist flowing over the garden with the Pennisetum in the foreground absolutely took my breath away. Those are the moments we gardeners live for..bliss! Isn’t the light amazing this time of year? Here, the sun rises at the perfect spot to hit the garden from the side right now, and when there’s any bit of fog to make that misty effect, I get really carried away with the camera. I hope you’re having a terrific September too, Scott! “Heart-breakingly beautiful” has tangible meaning embodied in that photo. Despite having been really jazzed by the vivid color that your first and final photo are screaming out joyously, it’s this more subtle palette that epitomizes the mood of summer’s waning days. 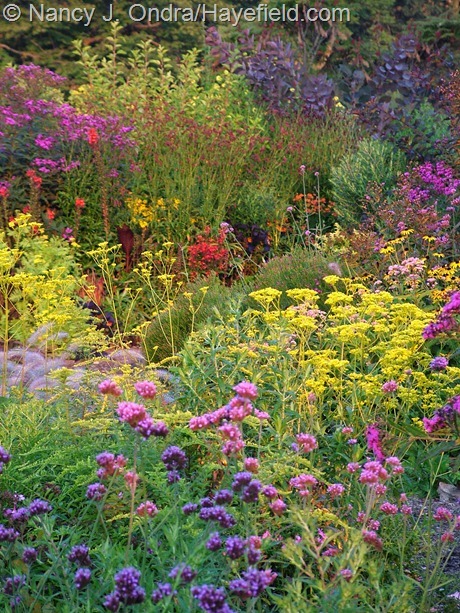 I cannot decide if I’m more impressed by your garden or your photography….both brilliant!!! The first and last photos are really my favorites. I sometimes check the color balance of the various garden areas by taking my glasses off to blur all of the lines, and those two photos capture that sort of impressionistic effect. Plus, the colors in that light are ridiculously vivid. I took them just a minute or two after the second-to-last photo, in the same part of the garden – just turned in the opposite direction. This time of year, it’s really hard to take a bad picture, though I do manage those too. Anyway, I hope you’ve been enjoying this beautiful spell of weather we’ve been having, Eric, before the deluge arrives tonight. Holy Moly! Your posts are always a lesson to me. 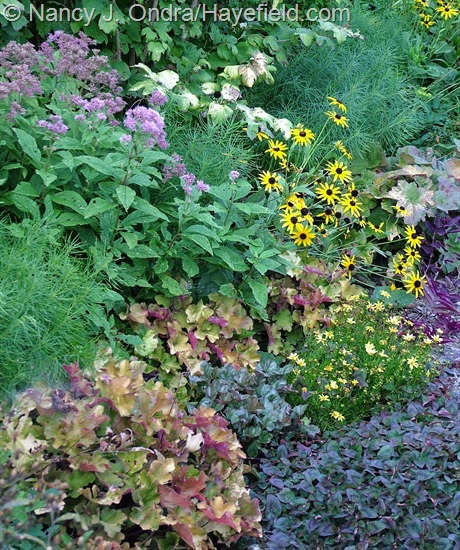 It makes me realize I still have so much to learn about gardening and plant combos. I love that shot of the tropical colors behind your front gate. And that one of the morning mist is just jaw-dropping. There’s still so much for all of us to learn, isn’t there? Doing these Bloom Day posts for several years has been such a helpful lesson for me, making me want to spruce up areas I seldom show and try new things in areas that end up showing repeatedly. This is a good time to start thinking about next year! Wow, that’s pretty amazing! I’m so impressed how lush everything looks – and the photos are just great. 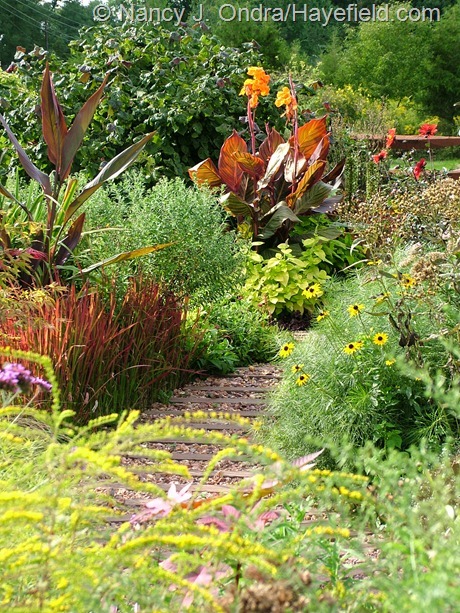 Amazing what regular rainfall can do for a garden, huh? We’ve been so very lucky for most of this year, it doesn’t seem fair for those who haven’t been so fortunate. Happy Bloom Day to you, TM! Superb as always Nan! That misty low-light shot is stunning. Your garden is so incredibly floriferous (sp?! ), and such a contrast to my own. Spring is officially underway here and everything is bright livid green and soggy underfoot. I can’t wait to get out into the soil! You get the fun of planting and seed-starting while we get to relax and enjoy the slow slide back to frosty weather. I wish you gentle rains and mild temperatures for your new growing season, Kerry, and lots of energy for your new projects. I never tire of looking at your garden Nan. It always has a few surprises. Happy GBBD. Thanks, Lisa! I think I’ve used up all of the surprises for this season, but overall, things should look rather different by next month. Happy Bloom Day back to you! “Well, things still look ‘pretty good’ around here” is a vast understatement. 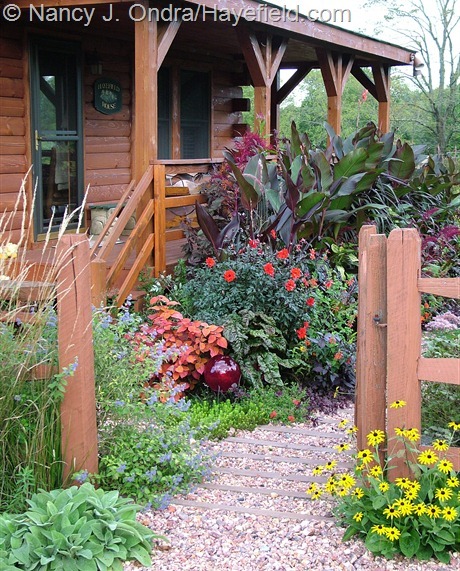 I’m not sure I could ever bore of looking at your garden. Sure would love to see it in person. Your color and texture combinations are stunning. Thank you for sharing!! I think this has been the best year ever, Toni – but then, I thought that last year, too. I’m so glad you enjoyed your visit! Hi Kate! You’ve probably noticed the arches before, but just as singles: I don’t think I’ve shot them so both were evident in one shot before. So, a Hayefield picture book, hmmmm. Maybe Hayefield through the Seasons? I’m not sure how it would sell, but it would sure be fun to put together. Are you kidding? It would sell like hotcakes! 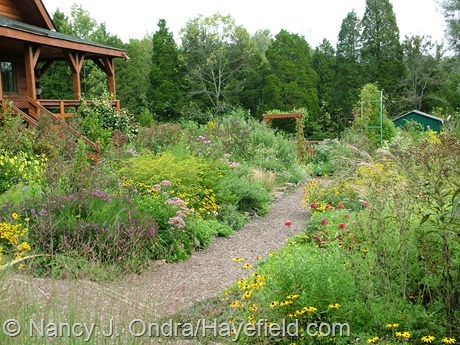 Following the garden through the year would be awesome! 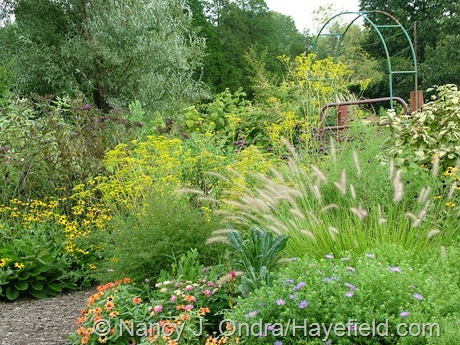 I loved the birth of the garden in your book, “Perennial Gardner’s Design Primer”. Would love to see more! Thank you for the encouragement, Kate. I’ll put it on my list of project ideas to think about. In the meantime, I’m working on something special for an upcoming post (probably in December) that I think will be really neat, though I’ll have to learn some new photo techniques and software to do it. Let’s just say that it’ll be a new way for folks to see the garden. I can’t wait to really get into it. Even Duncan and Daniel are helping! 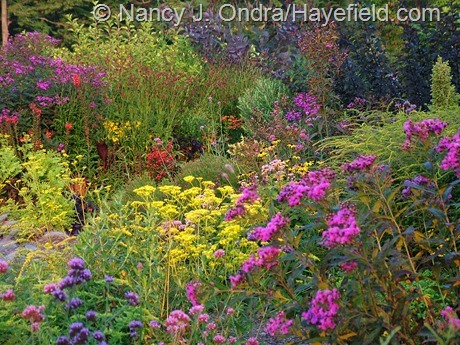 While most gardens are going to sleep about now, yours are at their climax. 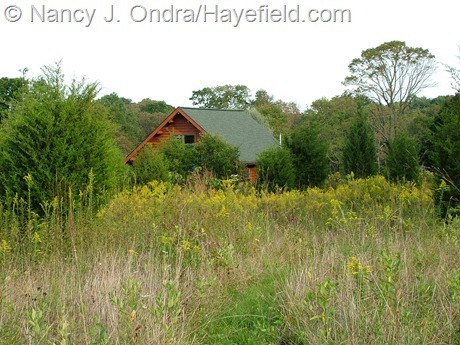 Gorgeous, love your grassy meadows with their deceptively carefree appearance. 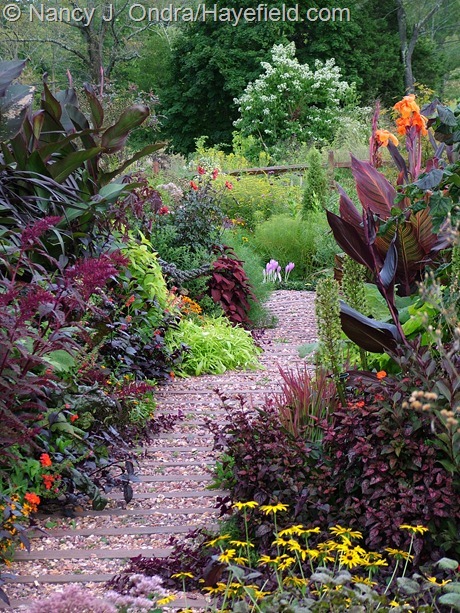 And I love the dark tropical look with red cannas and other dark foliage. Hopefully frost is a long way off so you can enjoy their show for a while. The grasses interspersed throughout the flowers really make a nice contrast. 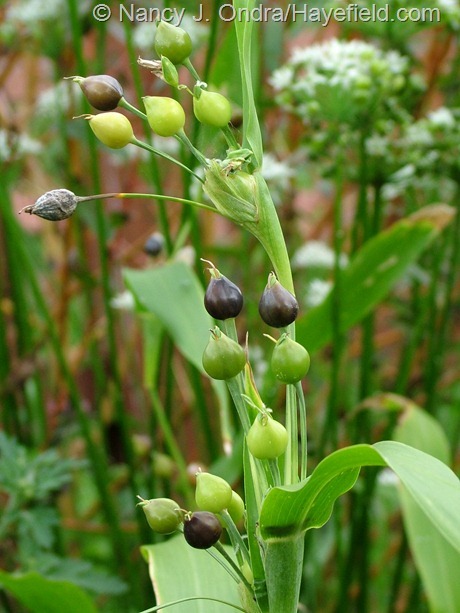 Have you found any grasses that are too invasive from seed dispersal that you have banned them from your garden? I like grasses but have a fear of them taking over. Just lovely Nan! Hey, Brenda. 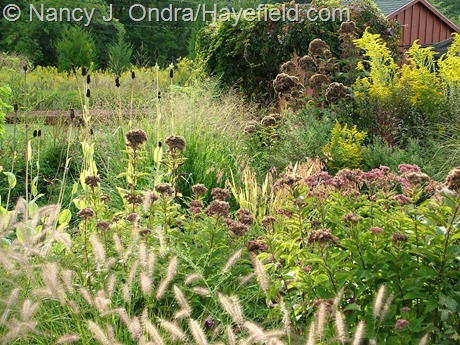 Well, the Sorghastrum, Schizachyrium, and Panicum cultivars do seed around, but since the species were in the meadow before I even built here, I don’t worry about them spreading. I am starting to worry about Pennisetum alopecuroides, because I’m seeing quite a few clumps now flowering in the meadow, and they could only have come from my garden. I’d really miss them in the garden, though, so I haven’t decided (yet) to remove them. I so enjoy the virtual strolls through your garden and always find inspiration in your combinations and your wonderful photos. Setting up for an early frost? I have the same feeling here in zone 6 Connecticut. Thanks for visiting, Joene. We’d usually be ok for another three weeks, at least, but with nights already dipping into the 40s, we may have a very short fall. It would be sad to lose the annuals and tropicals so soon. It’s great to see some of these flowers that I’d been interested in, considering we have similar climates it’s good to see what works in your gardens… I’ve been looking at that Lion Mint for awhile, and I’m happy to know it blooms at this crucial time in the fall for the bees! This creeping bramble (Rubus rolfei) you speak of… is it evergreen?! I must do some research! I love how gnarly it looks as a groundcover! Maybe you can find a place to wedge yourself in, Donna, but it’s petty tightly packed out there! The Leonotis really is cool. I haven’t noticed many bees on it (yet, at least): they’re busy with the asters and caryopteris at the moment. The creeping bramble (a.k.a. Rubus calycinoides or R. pentalobus) was evergreen for me this past winter but usually isn’t. Actually, it’s not so much green in winter as deep purple. Most years, it then turns brown in January or February, then leafs out again in April. Thanks for that! 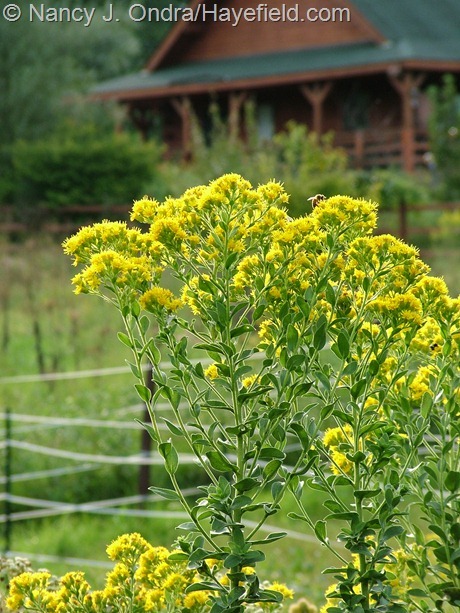 The golden lace (Patrinia) really is an outstanding perennial: great color, great shape, long bloom period, and even fall foliage color. 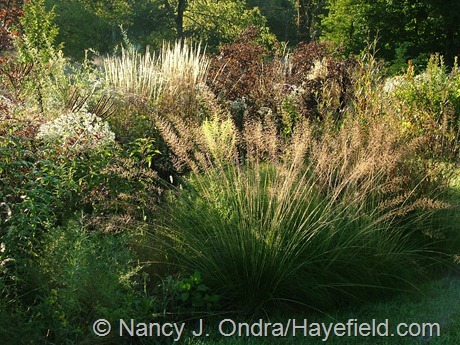 I have big bluestem as well as little bluestem: both of them out in the meadow, and little bluestem in the garden as well. But yes, there are many, many plants that I cannot grow, so I just do what I can with what works here. Wow…what a lot of lovely combinations. 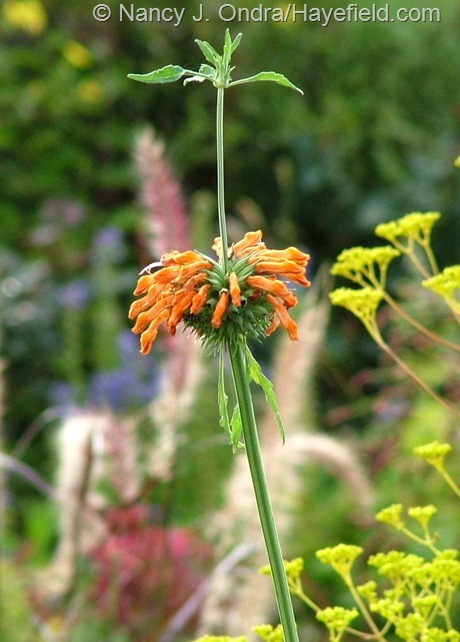 I hope you keep the Autumn Lollipop for the shape of its flower heads…very sculptural. I like the pods on the Job’s Tears grass for the same reason. (I’m an armchair apartment gardener, so I hope I’m using the correct terms to identify these plant parts…and, if not, hopefully you’ll still know what I mean!). Thanks for sharing your beautiful garden. Thanks for visiting, Flower, and for commenting. Happy Bloom Day! wonderful plants, some quite unknown by me, quite unexpected and beautiful combinations, lovely garden, beautifully photographed. Only one problem: I’m running out of superlatives! That’s a superb problem to have, catmint. Thanks so much for visiting, and for taking the time to comment. I’m glad you enjoyed the tour. Hmmm, maybe finished for this year, David. Except…well, there will soon be lots of bulbs to plant, and I do have one project in mind for outside the fence, which will involve redoing part of the courtyard as well, soooo…maybe not finished! I hope you’re thoroughly enjoying this autumn too. Thanks, Dee. I may be able to provide at least part of that experience in an upcoming post. Stay tuned for details! For now, thanks for taking the photo tour. I agree with every commenter here, including those about notecards and picture books. I tip my hat to you, Nan, you are a master of plant combinations. 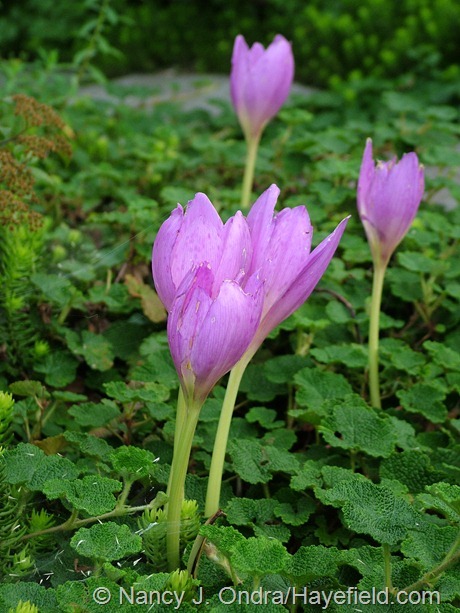 I was happy to see some colchicums in a few photos. You can take the credit for those, Kathy, because the colchicums you shared with me encouraged me to add others to the garden. I hope your new garden is proceeding well. Have a great fall! My garden and I are very glad to be of service, Casa, both for inspiration and education. Thanks for visiting!